Royal Cash slot is a 5 reel and 50 payline game that takes you on a journey to meet the King and Queen of iSoftBet! This majestic themed slot comes with amazing features like; wilds, multiplier wilds and free spins! Launch the game at Moon Games casino- the best online casino and enjoy the wins triggered from this game! On the reels of this innovative slot game, match three or more symbols like; gold accessories, crowns, bags of jewels, treasure chests, kings and queens to trigger a win! The top paying symbols of the game is the King and Queen, which awards 2,000 or 1,000 coins respectively for a five-symbol combination. Click on the Gear button, and access the bet tab where you can easily set your preferred stakes. Make use of Autoplay to enjoy the game hands free! Coin Values: Stakes range from the lowest amount of £0.50 to the highest amount of £250.00. Royal Cash comes with no lower than 5 wild symbols. The standard wild substitutes for all other symbols apart from the scatter, as well as quartet multiplier wilds. These land on reel 5 to boost any winning, and appear with values 2x, 3x, 5x and 10x. 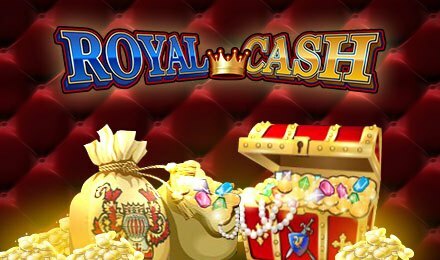 The Free Spins Feature is triggered by landing the Royal Cash Logo on consecutive reels. 2 scatters will get you between 10 and 15 free spins, 3 scatters award 16 to 25 free spins, 4 scatters award 26 to 35 free spins and 5 scatters award 50 free spins. During this feature, wins are boosted by multipliers of 2x, 3x, 5x or 10x. Earn more free spins by landing two or more scatters! Enjoy this slot game at Moon Games Casino, while you relax after a long day of work.